The Free Spirit Knee and Leg Walker by Essential Medical is a crutch alternative for patients who either cannot or choose not to use crutches. This walker was designed to aid people that are recovering from injuries and surgical procedures to the lower limb, especially the foot and ankle. Unlike crutches, the Free Spirit Knee Walker allows the effected limb to be supported so that the patient does not need to strain to keep it from bearing the users weight. It is designed so that the limb never touches the ground. This device allows patients to be self-sufficient and get around with less expenditure of energy. 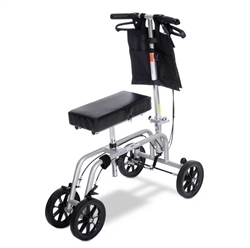 The tiller and knee pad are adjustable to accommodate different user heights. It folds easily making storage or transport a breeze. The Free Spirit Knee Walker includes a free vinyl pouch to store belongings. Injuries such as broken or fractured foot or ankle. Strained or sprained ankles. Damage to the achilles. Surgeries such as corrective surgeries to the ankle or foot, amputations, and fusions and hammertoe correction. Chronic conditions such as gout, bunions, complications from diabetes such as neuropathy or ulcers. Please note that due to often short recovery times, the Free Spirit Knee and Leg Walker cannot be returned once the box is opened or the product is used.